This book is really fantastic because it oscillates between real world concerns and the imagination. Often times adults may feel uncomfortable talking about real-world issues like poverty, death and struggle, but one thing we have to remember is that children are receptive and intelligent; they will see the world you see and feel the world you feel; and in a number of ways it’s important to let them into the light through discussion. 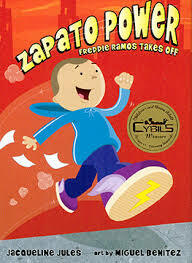 Zapato Power, Freddie Ramos Takes Off is a perfect opportunity for children to learn about hardship. It’s also a lighthearted journey which doesn’t focus on hardship, but on ways that life can be made easier – that is, if we all had magic shoes. By omilaju in absent father, absent parent, Boy Protagonist, Hispanic Latino Child, Single Mother, Single Parent on March 30, 2015 .